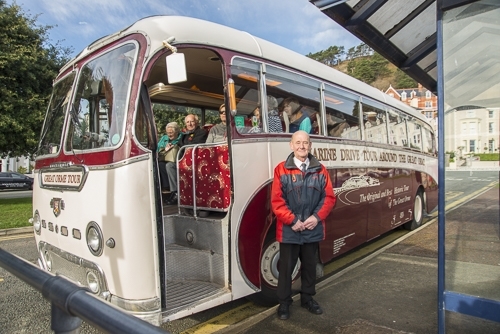 Our Great Orme Tour is operated by our small fleet of vintage coaches to transport guests around the magnificent Great Orme in Llandudno. The tour is a four mile scenic drive round the magnificent Great Orme headland to Llandudno's West Shore before returning once again to the Llandudno Pier entrance. During the tour you will enjoy spectacular views at every turn. By travelling on the vintage coach, you will witness the Great Orme from an elevated position and observe this wonderful natural asset from a comfortable seat. There are stunning views in all directions, all year round, from the brilliant flora and fauna of the summertime to the crashing of the waves below on a stormy winters day. Departing from Llandudno Pier 7 days a week. High above the sea is the lighthouse constructed in 1862 by The Mersey Docks & Harbour Company who, with great attention to detail, built a fortress like building using dressed limestone and vast bulks of Canadian pitch pine.The light, at 325 feet above high water, was the highest on the coast of Wales. It was first illuminated on December 1st 1862 and remained a continuous warning to mariners until March 22nd 1985 when the optic was removed. It can now be viewed at the Visitor Centre on the summit of the Great Orme. The Lighthouse now serves as an interesting and well appointed B & B guest house. Otherwise known as Mares Well. It is one of the few natural water sources on the limestone Great Orme. The fountain was constructed by the road builders to provide water for the horses (hence its name) that pulled the coaches laden with visitors in the days before motors. Way below the Marine Drive, on the south-western shelf near the west shore, are the remains of the Royal Artillery Coastal Gunnery School that moved from Shoeburyness to Llandudno in September 1940. Over 700 military personnel were based at the school at its peak. There is an area on the western slopes of the Orme, overlooking Conwy Bay, which provides excellent views across the estuary towards the ancient palace. An exclusive development now carries the name Llys Helig and offers superb views of the River Conwy estuary, Anglesey, the Menai Straits, Llanfairfechan and Penmaenmawr.